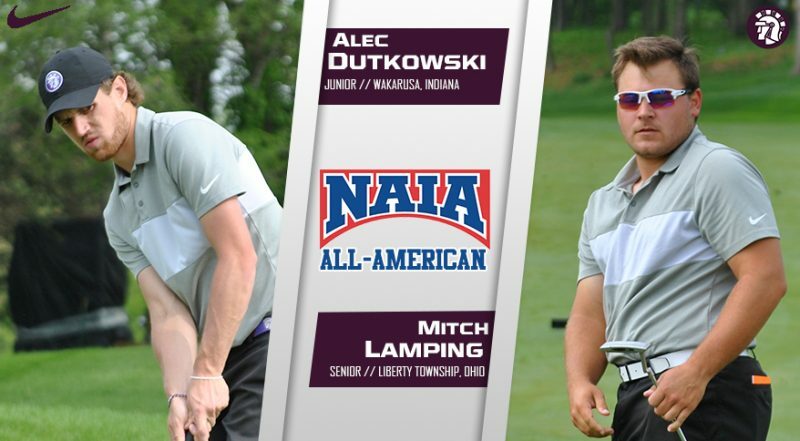 KANSAS CITY – Taylor University golf standouts Alec Dutkowski and Mitch Lamping were both named NAIA All-Americans, the NAIA national office announced recently. Dutkowski, a junior from Wakarusa, earned NAIA All-American honors for the third straight year after leading the Trojans with a 71.4 scoring average in 30 competitive rounds this season. Dutkowski, a former star at NorthWood High School and the two-time Crossroads League Player of the Year, earned First-Team All-American honors this season after earning Second-Team All-American honors last season and Third-Team All-American honors during his freshman campaign. Dutkowski is the first three-time NAIA All-American in the history of the Taylor men’s golf program after collecting five tournament victories during the 2017-18 season. Lamping, a senior from Liberty Township, Ohio, was named an NAIA All-American for the first time in his career following a stellar senior season. Lamping posted a 72.7 scoring average in 30 competitive rounds and collected eight top-4 finishes in 13 tournaments. The two-time All-Crossroads League player, Lamping earned Third-Team All-American honors. Lamping becomes the fifth All-American in Taylor history joining Dutkowski (’16, ’17, ’18), Terry Schaumleffel (’79), Don Faimon (’77), and Steve Renaker (’76).